This 1933 Soennecken Rheingold 915 is a button-filler in black, with gold-filled trim. This is a top-of-the-line model. The cap top has the “Starburst S” logo in it. The black sleeve surrounding the button on the bottom of the pen screws into the barrel so the user can depress the white button and fill the pen. When in the “down” position, the sleeve prevents the user from accidentally pushing the button. This specimen has a medium nib. Near mint. 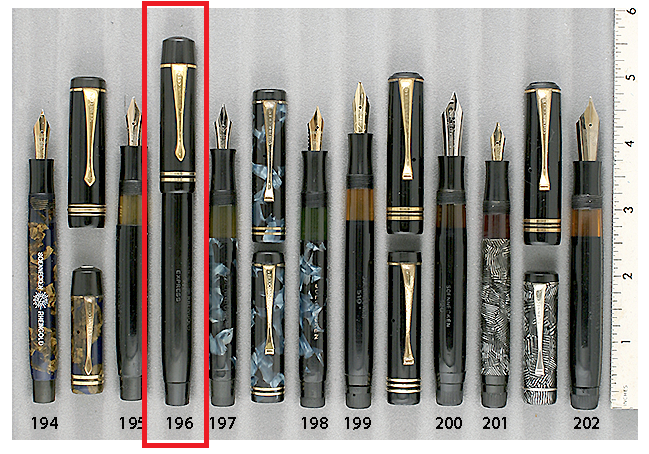 This entry was posted in Vintage Pens and tagged Catalog, Catalogs, Extraordinary Pens, Soennecken. Bookmark the permalink. Follow any comments here with the RSS feed for this post. Post a comment or leave a trackback: Trackback URL.